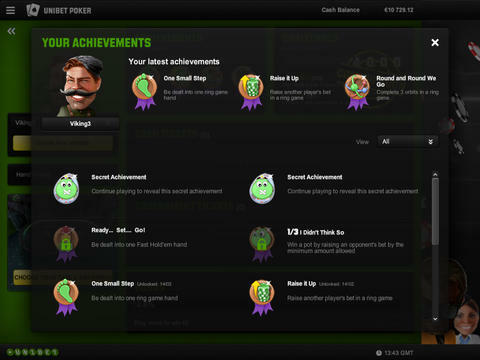 Unibet have developed their own real money poker app in-house so you are guaranteed to get something 100% unique when you play Unibet poker on your tablet or smartphone. iOS app available from the iTunes App Store. UniBet Poker is no longer available. We now recommend PartyPoker as the best app. 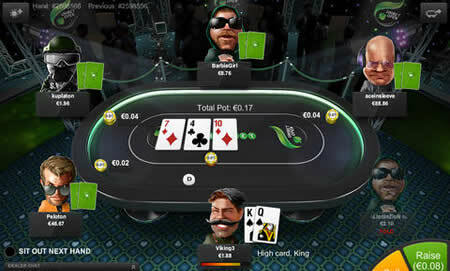 Unibet offer a native poker app for iPhone, iPad, Droid. Avoid sharks by changing your identity 3 times per day. Ideal app for those who want to play recreationally. Play Texas Hold'em and Omaha games for cash. Good selection of MTT's, Freeroll and Sit & Go's. Get £20 to play with when you make a deposit. Unibet has been around for almost as long as online gambling. In that time it’s built up a reputation as one of the most reliable and consumer-centric online gambling sites. It’s no surprise, then, that the Unibet Poker desktop client has been such a huge success, providing an experience that rivals that of dedicated poker sites such as PokerStars and 888. However, for an increasing number of poker players, a poker site is only as good as its mobile app. We’ve spent some time with the Unibet iPhone app and from what we’ve seen so far it’s every bit as good as the desktop client. You can download Unibet Poker straight from the App Store. It works on both iPhone and iPad. Once you’ve registered an account, head to the cashier in the app to deposit. It’s 100% secure and the deposit should only take a moment to go through. 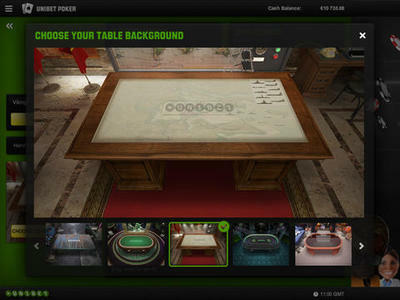 The app offers the standard assortment of poker games. You can play cash games, Sit & Go’s and tournaments in No-limit Hold’ em and Pot-limit Omaha. Cash games start at €0.02/€0.04 and go up to €0.50/€1.00 and Sit & Go and tournament buy-ins range from €1 to €100. If you’re looking for instant gratification, you should try the unique action-packed Banzai poker game. It’s the same as regular Hold ‘em or Omaha, except that players can only buy in for 10 big blinds. This means that in every hand one or more players will be going all-in preflop. It’s particularly good for mobile players because you don’t have to fiddle about with bet sliders as much. What’s more, the rake is extremely low in Banzai games at just 1% of the total pot. 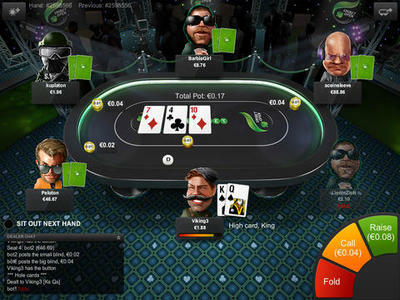 As well has having a solid selection of games on offer, the app lets you play up to four tables at the same time. This keeps things from getting stale as you’ll constantly be involved in a hand and will get dealt premium hands much more frequently. The user interface is one of the app’s greatest assets. It features a customisable 3D virtual environment that’s immersive yet understated. In this sense, it feels like a hybrid of old-school poker interfaces from the early 2000s and the modern, minimal interfaces that you see today. Players are allowed to choose from a huge roster of different avatars which are reminiscent of the old Full Tilt avatars. 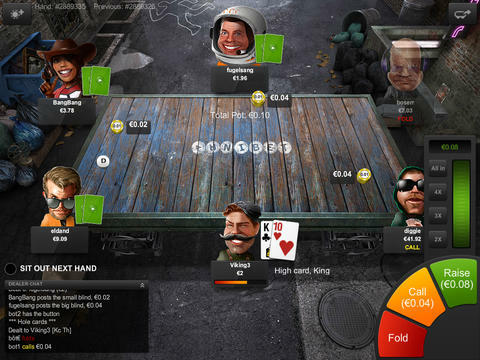 Unlike many mobile poker apps, everything is easy to see and the buttons are easy to press. The action buttons use a traffic light system to cut down on misclicks: fold is red, call is yellow and raise is green. What’s particularly great about the in-game interface is the alias system. It allows players to choose an alias for other players to see them as. It functions as a screenname separate from their username and can be changed up to three times a day. It means that (providing you change it frequently enough) your opponents won’t be able to remember who you are and how you play, nor will they be able to use software to track your stats. There’s a range of enticing promotions on offer at Unibet Poker. New players are offered €20/£20 worth of tickets up front as well as a €200/£400 first deposit bonus. Freerolls run every day with surprisingly decent prize pools, some of which are exclusive to new players. You can complete challenges and missions as you play to earn even more bonuses. All of this comes on top of a generous loyalty reward scheme. Unibet have crafted a fantastic iPhone poker app. The interface is slick and responsive and the games (particularly Banzai) are a ton of fun. Everything fits together to deliver a smooth and enjoyable mobile poker experience.